To celebrate the release of the new, reboot, of this week’s Great Old Gaming Gem we’re going back to where it all began. 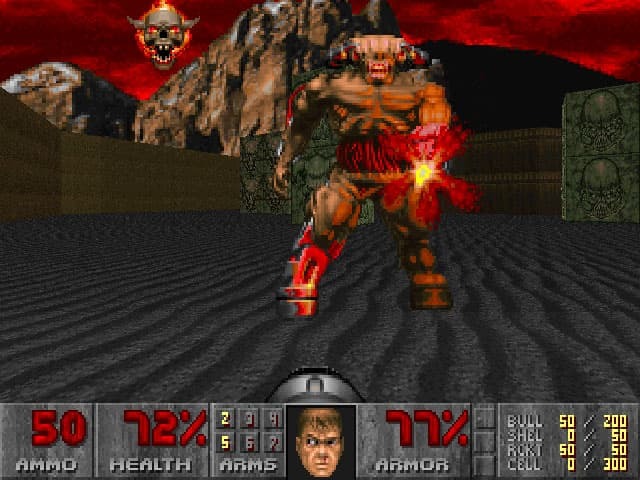 The year is 1993 and this is DOOM! There are some games in the world which have spawned a series, Call of Duty has spawned numerous sequels which tweak minor parts of the game along with improvements and balancing, other series include games like Sonic and Mario games, Final Fantasy games and so on. Few games can be considered as having spawned a legacy. Doom is one such example. Back when the average sound quality of a computer was on a par with an inbuilt computer card, programming was done in basic and we still used Windows 3.1, Doom let us play in the dark and properly scare ourselves. Though tame by modern standards, the twitches, the sounds, the blood covered walls all created a game which lived with you. You didn’t play Doom, you survived it. Whilst Wolfenstein 3D is technically the first modern first person shooter, coincidentally by the same developers as DOOM it was DOOM that in a game changing moment perfected the genre. Run, shoot, hide, shoot. It was fast paced frantic action that pushed the hardware of 1993 to it’s limits. DOOM and its subsequent sequels all based gameplay on some fairly simple tenants, don’t step on the lava/toxic waste, around every dark corner is either a possessed marine or demon that wants to steal your soul (more on those later), and always search for hidden passages to make sure you find the gatling gun, chain saw and rocket launcher early on. This combination of gameplay, sneaking through deserted space bases and even trudging through the depths of some hell dimension meant this game would always keep you on your toes. If you wanted to really scare yourself, you’d play at night, in the dark, no music just atmospheric sounds. I swear I’ve almost had a heart attack doing that, but its that thrill that keeps the game enduring. Those demons? Levels effectively set in Hell? They started something else too. Something that’s still with us today and that’s controversy with all the main stream media backlash that goes with it. DOOM was accused of making teens violent, promoting Satanism (pretty sure the object was the kill the demons not join them but hey ho), and just about everything else in between. It’s not secret that the MegaDrive port was the first game ever to be given a Mature Audiences Only warning in the States. Not even the original Mortal Kombat managed that. All that controversy though? It fueled sales big time. DOOM also gave PC gamers something else that was at the time revolutionary and that was user made Mods and level packs. The modding community was so strong that in 1997 ID Software released the source code to the world. Now nearly 20 years later people are still making new levels and mods. Few other games have had such sheer longevity. Since it’s release DOOM has been ported to the SNES, MegaDrive, PSOne, Saturn, and pretty much every other console ever made. It’s also become something of a badge of honour in modding and hacking circles to boot a playable version of DOOM on anything with a screen and an interface. This was recently taken to the extreme when a Chainsaw, yup you read that right, was installed with DOOM. There’s video of that particular piece of awesome below. 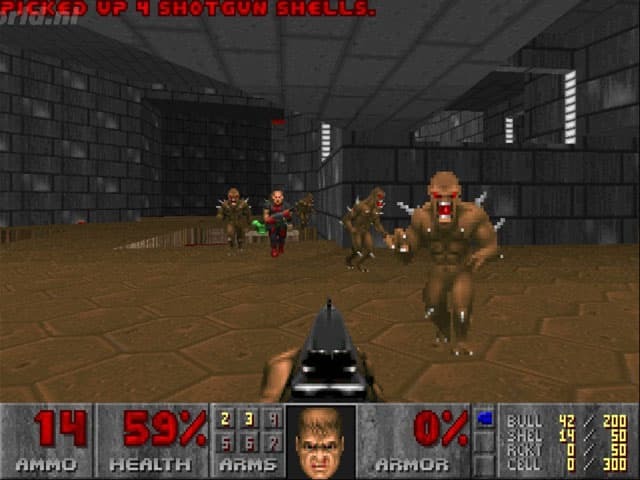 DOOMClone became the name first person shooters were known by for near enough a decade after the games initial release. I remember a review of GoldenEye on the N64 that called it the perfect DOOMClone. High praise indeed. DOOM, as I’m certain you’ve gathered, is a hell of a fantastic game and playing it is playing a piece of videogame history. The National Videogame Archive have a display with the original master copy. The one thing you need to remember is this, no Doom, no Call of Duty, no Goldeneye, no Half-Life, no Halo. No FPS as a genre. The legacy of this game can never, ever, be over stated. 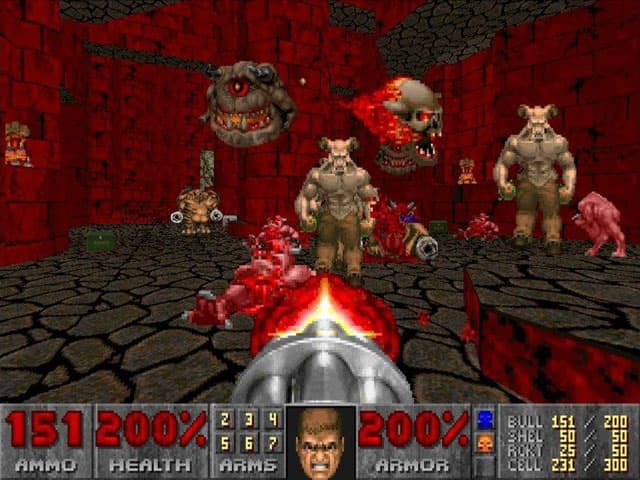 With the imminent release of the new DOOM I still know which version people will be playing in 25 years time. It’ll be the one from 1993.